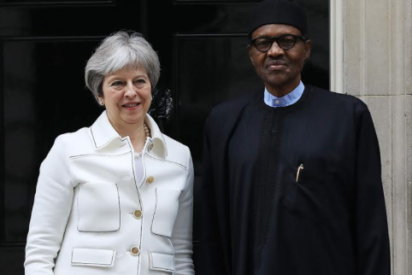 ABUJA – PRESIDENT Muhammadu Buhari in London on Monday told the British Prime Minister, Theresa May, that though the country will be having elections in 2019, his primary concern was to tackle insecurity and also put the nation’s economy in a better position. President Buhari stated this when he held a bilateral meeting with the British Prime Minister, at 10, Downing Street, London. Recall that the President had declared his intention to seek for re-election last week Monday at the National Executive Council, NEC, meeting of the All Progressives Congress, APC, in Abuja, before he left for London. President Buhari in a statement signed by his Special Adviser on Media and Publicity, Chief Femi Adesina, told Prime Minister May that his administration’s strides in agriculture, had put Nigeria firmly on the road to food self-sufficiency. He said, “I am very pleased with the successes in agriculture. We have cut rice importation by about 90 percent made lots of savings of foreign exchange, and generated employment. Speaking on climate change and environmental issues, President Buhari brought up the necessity of inter-basin water transfer from Congo Basin to Lake Chad. He said “The Lake Chad is now about 10 percent of its original size, and it is perhaps one of the reasons our youths dare both the Sahara Desert and the Mediterranean, to get to Europe. “But if there is inter-basin water transfer, about 40 million people in Nigeria, Niger, Cameroon, Chad, and other countries stand to benefit. I made the case during the Climate Change Summit in France. If Lake Chad is recharged, it will reduce the number of youths coming to Europe to increase social problems. In her remarks, Prime Minister May said Britain would continue to work with Nigeria in the areas of training and equipping the military. While commending President Buhari for his efforts in improving trade and business for Nigeria, the British Prime Minister said it was also time to boost intra-Commonwealth trade. The post 2019: I’m not bothered about politics – Buhari appeared first on Vanguard News.